White pomfret is an ocean fish. From side view, it has a diamond shape. With a very flat body and silver in color, pomfret that is available at Asian supermarkets weighed about 3/4 of a pound on an average. It comes frozen. 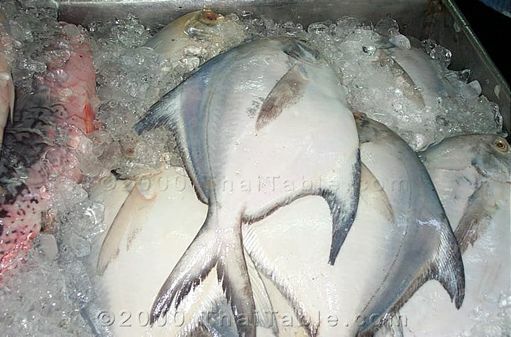 Grey pomfret is also available. It looks the same except for the color, greyish. I would not recommend getting the grey pomfret - I don't like the taste as well and the bones are not where I'd expect. Pomfret is one of the few fish that does not taste fishy. It has a beautiful white meat with central and side bones. It is considered a prized fish. However, at the current exchange rate, the fish is very very affordable.